Blood Pressure Clinics will be held on Saturday, April 6th following the 4 PM Mass and Sunday, April 7th after the 8:30 and 10:30 AM Masses in the Conference Room. All are invited to attend. Click “BLOOD PRESSURE” to print a form for the free clinic. Parish Nursing and Health Ministry is a Parish-based ministry, which cares for the whole person — body, mind, and spirit. This ministry arises from the needs of the Parish Community and is realized through the talents of registered nurses and other health professionals or lay leaders who combine health science with pastoral care. While each Parish Community’s program is unique, all programs provide for wellness, health, and healing as well as access to community health resources. Meet our Parish Nurse, Mary Beth DeGon, RN. Mary Beth was raised in Lexington, MA. She began her nursing career later in life, already a wife and a mother. Initially, she graduated as an LPN from Youville Hospital in Cambridge. Her first position was working as an LPN staff nurse in a convent for the Grey Nuns in Lexington. Mary Beth later went on to earn her Associates Degree in Nursing at Middlesex Community College in Bedford. Mary Beth has experience in a variety of health care roles. She worked for 10 years as a staff RN on a Medical/Surgical Unit and in the Intensive Care Unit at Symmes Hospital. The last 30 years of her experience involved administrative roles that included Nurse Manager of ICU at Choate Hospital, Nurse Manager of Surgical Services that encompassed Operating Room, Recovery Room and Surgical Day Care Units at Cambridge Hospital, and Nurse Manager of a Neuro Rehab Unit at Shaughnessy-Kaplan Rehab Hospital on the north shore. Mary Beth then returned to the Grey Nuns convent in Lexington as Director of Health Care and assisted the nuns during major renovations to the building and facilitated the transition and conversion to an Assisted Living Facility, Youville Place, which then opened up to the public. Mary Beth’s experiences continued in a Supervisor role at Mount Auburn Hospital, Atria Woodbriar Assisted Living Facility in Falmouth, Rehab Hospital of Cape & Islands in Sandwich and Falmouth Hospital. She retired in 2014 with 40 years of experience. 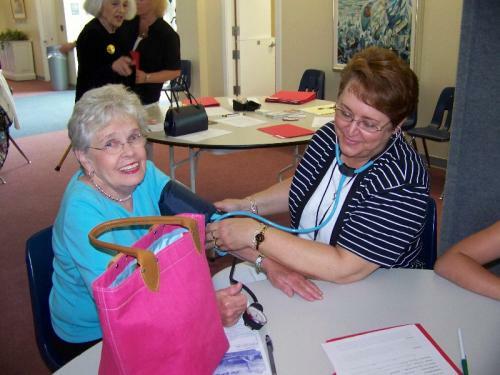 Mary Beth has volunteer experience with the Blood Pressure Clinics here at Christ the King Parish. She also volunteers with one of the cooking teams for meal delivery service to the St. Joseph’s House Shelter. And she is the caregiver for her 95-year-old mother. Mary Beth graduated in 2015 from the Parish Nurse Program offered at the Archdiocese of Boston, Braintree earning the designation as FCN, Faith Community Nurse. She is married, has 3 children and 4 grandchildren and lives with her husband, Gary, in Mashpee. She is grateful for the opportunity to serve as the Parish Nurse for the Parish of Christ the King. If you have any questions or comments, please go to “contact us”, all submissions go directly to the parish office. The Parish of Christ the King? Provide blood pressure monitoring services and health counseling at designated times each month. Make home/hospital/nursing home visits to parishioners, as requested by the Pastor, The Pastoral Care Committee, parishioners’ families, or other persons. Identify the need for educational programs; also, support or volunteer groups, per the interests and needs of the parish. Initiate, lead, and participate in health-related programs that assist parishioners to achieve wholeness of body, mind, and spirit. Participate in personal spiritual formation opportunities and provide spiritual support to parishioners, as needed. Parish nursing services will NOT duplicate professional nursing services provided by other health care agencies. The American Nurses Association recognizes parish nursing as a specialty and parishioners follow the Scope and Standard of Practice for Parish Nursing. members in their home or in the hospital. Promotes the relationship between physical and spiritual health through parishioner-based programs. Assists parishioners to understand their health care needs. the Health Care Ministry Team; provides education to assist them in their roles. Encourages healing of body, mind, and spirit through visitation, prayer, and a listening presence. How are These Roles Accomplished? ~ Individual counseling for symptoms, medications, etc.